Times are getting pretty tough for Cosima Neihaus (Tatiana Maslany), the one-woman Clone Club R&D department in the Orphan Black universe. What started out as an irksome cough has progressed into a full-blown autoimmune disorder affecting her respiratory and reproductive systems. In one recent episode (Community of Dreadful Fear and Hate), the extent of Cosima’s decline was revealed through a rather unsettling incident in the apartment of her new love interest Shay (Ksenia Solo). Up until this point, Cosima’s mysterious symptoms were being kept in check by an equally mysterious treatment—a stem cell therapy initially derived from the baby tooth of her niece Kira Manning (Skyler Wexler). As we’ve already covered stem cells in this series of articles (specifically, in a previous post on spindle proteins and the feasibility of human cloning), we know stem cells aren’t merely restricted to science fiction and unrealistic research grant proposals anymore. Once again, Orphan Black seems to be a reflection of our near future or top secret present. Before we ask why our physicians don’t offer us rejuvenating stem cells, let’s once again see if Orphan Black’s writers are getting things right by asking a few related questions. How do you actually obtain stem cells? (Is it really possible that the Tooth Fairy is at the forefront of modern medicine?) Once you have isolated stem cells, how do you use them to treat devastating medical conditions? Oh yeah. And how is stem cell therapy even supposed to work? Stem Cells 101: What are they? For those of you who missed the previous spindle protein problem post (try saying that ten times fast) or perhaps just need a refresher, stem cells are the cells inside of developing and adult organisms that give rise to various types of cells. Every cell in your body is the distant descendant of a single solitary stem cell (more on that shortly). Your red blood cells transport oxygen and carbon dioxide. Your neurons zap signals around your body in the blink of an eye. And your epithelial cells give you this wonderful waterproof coating (i.e., skin) that keeps your insides from being mixed with your environment, and vice versa. Stem cells, on the other hand, just divide. What makes stem cells unique is that they are undifferentiated, meaning they can divide to produce new parts of an organism (as a part of a processed called cell differentiation) or replace damaged cells. It’s easy to see why scientists are trying to figure out how to harness these cells. If you want to tap into the miraculous healing power of stem cells, should you just start drilling into baby teeth? The short answer is sort of. Baby teeth contain only a single type of stem cell. Yes, that’s right. There are types of stem cells, and they are classified according to what kinds of mature cells those stem cells can become. Initially, there are embryonic stem cells. The zygote that each of us used to be, as well as the cells that comprised our next smidgen of embryonic development, were totipotent embryonic stem cells. Any one of these cells could go on to produce the cells that form every tissue of your body. Within the first couple cell divisions, you could have actually rearranged this cluster of embryonic stem cells and still have produced a totally viable organism because the genes that regulate organismal development (like the Hox genes mentioned in the evo-devo article) had not begun to shape cell differentiation. Totipotent stem cells are totally undifferentiated, and because of this, they can become separated from each other and produce genetically identical twins—nature’s Project Leda is happening inside uteruses every single day. However, after just a few hours of growing, dividing, and repeating, these totipotent stems cells differentiate into merely pluripotent stem cells, which can eventually produce any mature cell type, but cannot produce an independent organism. Similarly, pluripotent stem cells do not just get to work forming adult cell types; rather, they divide into multipotent stem cells, such as the mesenchymal stem cells found in the molars that children lose when they are roughly the same age as Kira. 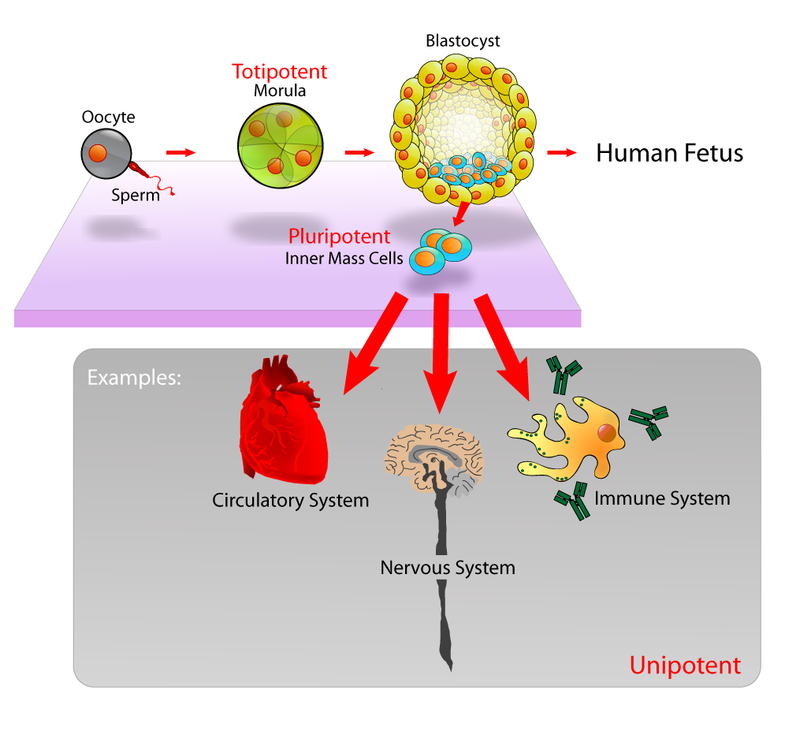 Multipotent stem cells can then in turn produce oligopotent or unipotent stem cells that finally produce the mature cells that make up the tissues of our bodies. However, by the time a stem cell has differentiated into a multipotent stem cell, certain cell types are developmentally off limits. For example, the mesenchymal stem cells that are found in teeth typically only become cartilage, bone, and fat cells. For athletes with torn knee cartilage and elderly folks with broken hips, mesenchymal stem cells could be literal game changers and new leases on life. But alas, a mesenchymal stem cell can’t normally become lung or ovary tissue, leaving Cosima in a predicament. But biologists are currently evaluating techniques to turn back the clock on multipotent stem cells—to revert them back into pluripotent stem cells that may theoretically repair nearly any tissue. There is some hope that this is possible because the mesenchymal stem cells inside of teeth do not directly come from stem cells—instead, they come from nerve cells. Findings like this have encouraged scientists to artificially induce stem cells in the lab from differentiated cells to produce what are referred to as induced pluripotent stem cells (iPSCs). So far, scientists have been able to produce iPSCs in Petri dishes as well as inside living mice, but both types of techniques produce the same outcome; once introduced into living organisms, iPSCs typically develop into teratomas, a type of tumor that resembles the earliest stages of an embryo. In other words, these iPSCs are actually behaving like stem cells, but not receiving the correct signals to replace missing tissue and organs. Similar results have been achieved in the lab through a process known as somatic cell nuclear transfer (SCNT). As mentioned in a previous post, scientists like Dr. Shoukhrat Mitalipov are working on not only reproductive human cloning but also therapeutic human cloning in order to produce custom-made stem cells. The problem with transplants of any tissue (including stem cells) is that they have a tendency to be rejected by our immune systems—unless the donor tissue is similar enough. If therapeutic cloning could be used to produce stem cells, however, your body would totally accept these new cells because they would share your genome. In other words, SCNT-based therapeutic cloning could be the breakthrough that replaces all human transplant operations—someday. For now, therapeutic cloning suffers from the same problems as iPSCs—typically, SCNT-derived stem cells also develop into teratomas, rather than the damaged tissue it was intended to heal. While therapeutic cloning might still be science fiction, at least one form of stem cell therapy certainly has been saving lives for decades—bone marrow transplants (just like the one that was planned for Cosima at the end of season 2). Don't be scared by the terrifying size of this mortifying needle. Harvesting bone marrow is a relatively simple in-patient procedure that provides the life-saving stem cells used for bone marrow transplants. Since 1968, bone marrow transplants have been used to restart the immune systems of folks who have undergone chemotherapy or radiation therapy to destroy the malignant cells responsible for lymphoma or leukemia. This primordial stem cell treatment actually works in precisely the same way that cutting-edge stem cell therapies will hopefully one day work. Stem cells are isolated from bone marrow that was collected from a matching donor (or the patient prior to chemotherapy), and are simply fed into the patient via IV, just like a blood transfusion. The stem cells are carried by the circulatory system all over the body, but those that make it into a patient’s bones take up residency and begin to produce the white blood cells that every person needs to fight infections. This is precisely how other stem cell therapies should work, but because of cell programming issues (such as epigenetic switches) the stem cells either begin to produce the embryo-like teratomas or totally fail to establish. Apparently, the progression from toti- to pluri- to multi- to olig- to uni-potent stem cells matters, as do the developmental signals that cells receive along the way. Multipotent to unipotent stem cells may have more of the programming necessary to ensure they start dividing correctly, but so far the only methods that have achieved this in mice are unsafe for human beings. But the safety concerns haven’t stopped unscrupulous clinics from offering supposed stem cell therapies, which the FDA warns may be dangerous. While there is a constant flow of incredible stem cell breakthroughs happening in laboratories (like the induction of stem cells to produce insulin) and even human clinical trials (like the limited restoration of vision), there are currently no available stem cell therapies other than bone marrow transplants. But try telling that to parents of sick desperately, chronically ill children, like Judy and Gary Susser (who were the focus of a segment on 60 Minutes). Their child Adam was born with cerebral palsy that left him totally dependent on others for all basic life functions, so they leaped at the opportunity for him to undergo unproven stem cell therapy in Mexico. In Adam's case, the treatment did nothing, but not everyone is so lucky. A common stem cell-based plastic surgery consists of liposuction and the isolation of mesenchymal stem cells (our old friend that can make bone, cartilage, and fat cells) that are then injected back into the area to be rejuvenated. While usually this procedure does nothing at all, there have been reported bases of these stem cells actually "working"—and by "working," I mean developing into minute bone fragments in people's faces (as covered in this Scientific American article). People are spending their life savings in the hopes of increasing their life spans or merely shedding some wrinkles, only to end up disappointed while impoverishing their families and potentially hastening their deterioration. Can Kira’s stem cells or bone marrow save Cosima’s life? Are the mesenchymal stem cells derived from stem cells going to cure Cosima or anyone for that matter? No and maybe—let me explain. Mesenchymal stem cells can only differentiate into specific types of cells. If the stem cells used in treatment are pluripotent, totipotent, or just happen to be the correct sort of multipotent stem cells, then you are in luck, potentially. If the stem cells are introduced to the affected areas, they can theoretically differentiate into the appropriate tissue and save the day—hurray! The stem cells retrieved from the pulp inside of teeth are mesenchymal, while the symptomatic tissues in the Project Leda clones are of endodermal origin. In layman’s terms, the affected cells in Cosima went down a different developmental pathway, and therefore can’t become new reproductive or respiratory tissue without some very fancy biomedical techniques that have not been achieved in humans. Similarly, bone marrow is full of stem cells, but the wrong kind of stem cell to help the clones overcome their mysterious illness. Because the tissues of Cosima’s reproductive and respiratory systems are not derived from mesenchymal stem cells, all the baby tooth stem cells in the world won’t make much of a difference to the clones until Dyad, Cosima, Scott (Josh Vokey), or someone figures out a way to reliably turn those multipotent mesenchymal stem cells into the appropriate kind of stem cell. At this point, there is surely a Nobel Prize brewing in a laboratory, but we are still years away from real stem cell therapies.